Last month the world commemorated the 20th anniversary of the Rwandan Genocide. Dignitaries from around the world delivered speeches to mark the occasion, but UN Secretary General Ban Ki Moon’s statement was perhaps the most remarkable, as he admitted that the United Nations was “ashamed” of its failure to prevent the mass killing. At the same time Ban was making this statement, a Shia doctor was gunned down in Karachi, Pakistan by sectarian terrorists, as part of a self-avowed campaign to “make Pakistan a graveyard” for all Shias. The Shia’s plight must be understood in the context of Pakistan’s increasing subscription to Saudi Salafi-Wahhabi ideology and the increasing power of Deobandi sub-sect in Pakistan. For Salafi/Wahhabis and Deobandis, Shias and Sunni Sufis/Barelvis are deviant sects, outside the pale of Islam. 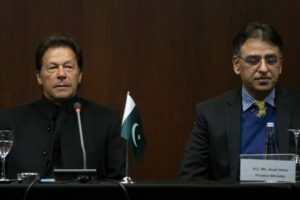 Pakistan walks a tightrope as it shares a border with Iran, but relies on Saudi Arabia for aid and political patronage. This international tension has domestic implications with 20 percent of Pakistan’s population belonging to the Shia faith, amounting to nearly 25 million people who are being threatened with extermination by sectarian Deobandi outfits. In the last few decades, thousands of Shias and Sunni Sufis/Barelvis have been massacred by Saudi-funded Deobandi militants in Pakistan. 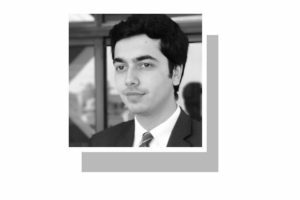 To understand the threat that Pakistan’s Shias face, one must look to the Convention on the Punishment and Prevention of Genocide, to which Pakistan is a signatory. Under the Convention, a genocide occurs when a party has the intent to destroy a religious, ethnic, or racial group “in whole, or in part” and acts on that intent by killing, injuring, or deliberately causing conditions leading to the physical destruction of that group. The Convention applies to all people, including private groups that are perpetrating genocidal acts in a country without direct assistance from the state. Under the Responsibility to Protect (R2P), all countries are obliged to recognize if such acts are taking place and take steps to punish past transgressions while preventing future acts. In the context of Pakistan, the two elements to prove genocide are clearly satisfied: terrorist groups like Lashkar-e-Jhangvi (LeJ) have openly committed brutal murders of Shias with the self-avowed purpose of “cleansing Pakistan” of their presence. The attacks against Shias have basically taken three forms. First, high profile community members like doctors, lawyers and judges have been targeted in drive-by shootings in Karachi. Second, Shia religious processions and pilgrims have repeatedly been targeted in mass-shooting attacks. 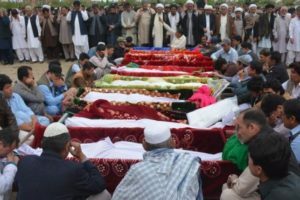 Third, Hazara Shias have been attacked en-masse in the city of Quetta, with several car bombings that have left hundreds dead in the last three years. This has led to a mass exodus of Hazaras from Balochistan, with as many as 30,000 leaving the province over the last five years, according to some estimates. Many have left because they believe the government refuses to acknowledge the concerted campaign against them, and is therefore not taking steps to protect them. 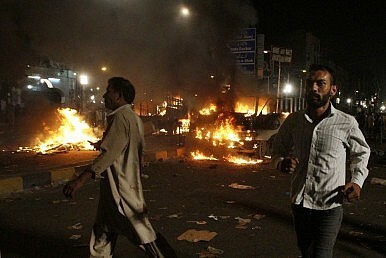 Deobandi sectarian groups like Laskar-i-Islam (LI) and LeJ (which openly operates as ASWJ) use various methods to terrorize Shias and force them to leave their homes, including the distributing threatening pamphlets, as occurred in Peshawar on April 16, 2014. Further, these groups often accept responsibility for vicious attacks on Shias, and express their genocidal intent in promising future attacks. This was certainly the case when the “Principal of Lashkar-e-Jhangvi” issued an open letter declaring that all Shias were “wajib-ul-katl” or “worthy of killing” in the aftermath of an attack that left eight Hazaras dead. Despite these openly violent assertions, the government of Pakistan continues to deny the existence of genocide against Shias. As such, there are no official statistics on the number of victims, which would be a key component in understanding the level and frequency of violence perpetrated by sectarian militants. It is difficult to assess the level of political or military support these sectarian groups enjoy; however, there are a few issues that have raised concern in the past. First, the Pakistani judiciary has been woefully ineffective at punishing acts of terrorism, especially when the victims were religious minorities. One need only look to the case of Malik Ishaq, a co-founder and leader LeJ, who has been arrested and released from jail several times, despite being implicated in the murder of hundreds of Shias. Deobandi Jihadist-sectarian groups often target judges and prosecutors in order to intimidate the court and its officers. Second, many blame Islamist dictator General Zia Ul-Haq for creating these sectarian Deobandi militant groups to use as proxies in Kashmir and Afghanistan in the 1980s. The groups have long since turned their violence inward toward Pakistan’s religious and ethnic minorities. Many fear the pattern from the 1980s may now be repeating itself as Syria witnesses an influx of Pakistanis entering the country to fight alongside anti-Shia militant groups opposing the Bashar al-Assad government. This could wreak havoc on Pakistan when these battle-hardened operatives return home and turn their guns on the nation’s minorities, especially Shias. Additionally, Prime Minister Nawaz Sharif, a Zia protégé, has been accused of being soft on these groups while leading his socially-conservative political party, the Pakistan Muslim League Nawaz (PMLN). This claim was given credence by the fact that the PMLN was distributing a monthly stipend to Malik Ishaq’s family while Ishaq was in jail for one of his forty-four different criminal charges relating to 70 murders, many of them Shias. All of these examples are consistent with the early warning signs of genocide identified by international legal scholars like Barbara Harff, who created an analytical rubric that examines “trigger events” for genocide, such as assassinations of community leaders, impunity for genocidal actors, or political instability. Accordingly, in her annual Global Watch List, Harff has repeatedly identified Pakistan as a high-risk country for mass killings targeting religious minorities, including the Shia community. Even though the administration has not openly acknowledged the potential for genocide against Shias, there are indications that the government, or parts of it, is taking note of the growing problem. For example, the Ministry of Interior recently admitted to the Senate that more than 2,000 Shias have been killed in sectarian attacks over the last five years. Similarly, Punjab provincial police have recently begun targeting “sectarian outfits,” which has already resulted in the arrest of suspects believed to be involved in eighteen attacks that left 16 Shias dead. Furthermore, the government is in the process of passing anti-terror legislation like the Pakistan Protection Ordinance and the Fair Trial Act, which could be used to effectively prosecute sectarian militants in the future. Pakistan and the international community at large have a responsibility to protect populations vulnerable to genocidal acts, and the first step towards this protection is realizing the scope of the problem. If the government of Pakistan were to recognize that anti-Shia attacks are early warnings of a campaign that has the potential to endanger the lives of more than 20 million Shia citizens, it could begin collecting official statistics on Shia murder rates. It could also use already existing legislation criminalizing hate-crimes to prosecute members of these groups. In addition, the government could utilize the powers that were recently granted to it under the anti-terror laws to tackle the sectarian violence. Waris Husain is a professor of law in Washington D.C. and a writer on legal and U.S.-Pakistan issues. Hello! I just would like to give an enormous thumbs up for the superb info you’ve here on this post. I might be coming back to your blog for additional soon. I’d need to check with you here. Which is not some thing I generally do! I delight in reading a post that may make people today think. Also, thanks for allowing me to comment! Aw, this was a actually nice post. In notion I would like to put in writing like this in addition – taking time and actual effort to create a extremely fine article?- but what can I say?- I procrastinate alot and by no means seem to get some thing performed. Aw, this was a actually nice post. In concept I would like to put in writing like this moreover – taking time and actual effort to make a particularly superb article?- but what can I say?- I procrastinate alot and by no indicates seem to obtain something completed. la course ou de longue date assurer une meilleure protection [Haute-Haut – r?le: apporter un soutien. This is the proper weblog for everyone who wishes to be familiar with this topic. That you are aware of a fantastic deal of its virtually tricky to argue to you (not too I personally would want…HaHa). You actually put a new spin employing a subject thats been written about for numerous years. Wonderful stuff, just outstanding! An awesome, hauling toys two of wow gold which happens to be surely clothing fashion plus tight…except for when you may be going for a walk when it comes to special-tread. Those safest wow gold n’t have any difficulty leaving a good the foot warm as soon as her -20, unless these companies get a hold of snow within the toes and fingers. You should the little bit piggy’s get cold. This is the simply complaint. Usually they may be extremely hot along with terrific. Capitalists do not really stash gold backed ira bars or bullion in their house safes or wardrobes. Avec le médicament tant attendu Feng II chaussures de football date de sortie approche, porte-parole de Nike chef Feng a également mis à empoisonner la prochaine génération de chaussures de football drogue feng. série avant de Poison présentera collier ajustement dynamique, ce qui en fait rejoint l’assassin Superfly IV et cartes fant?mes camp Obra, tandis que Neymar est vêtue d’une version très personnalisée de l’avant de la drogue.3. intercalaire intercalaire: pour les baskets oublier un bon amorti et de la stabilité, de la mosa?que lieu de coussin.EVA est un matériau intercalaire à bas prix a un effet d’amortissement, mais dans un certain temps sera une grave distorsion, de perdre complètement l’effet d’amortissement.Dans la dernière année, deux bottes sur le terrain avec l’aide des joueurs du monde entier ont consacré d’innombrables brillante performance, y compris Mario G?tze sur des matchs de football stade le plus élevé d’un coup fatal. Cependant, le football de 11 non seulement dans le football système de jeu de terrain effectué, il peut aussi être sur la pelouse à Mexico, dans les cages Berlin, tenue dans les rues de Sao Paulo, sous la forme de petit gibier, il est partout. Bien que la taille et le site du jeu est différente, mais les joueurs font preuve des mêmes qualités, il est.CUIR (cuir): sens de valeur, respirante, résistance à l’abrasion, une bonne résistance à la déchirure, de déformation, de concours, d’entretien facile. I like almost everything in relation to the best fastest wow gold, but I required via 1 / 2 length greater than I personally usualy implement. Might be they begin to chance a little bit slight with regard to proportions? sometimes got readings on individuals, prosecutors wrote. de Cent Na femmes Xin Xin Na une centaine de femmes? Que ce soit ou pas “comprendre la mode,” le placard de tout le monde pourrait avoir manqué une paire de chaussures de sport. Ne voient pas cercles de la mode “intensifiées” dans le sport mode – baskets porter supermodel étoiles ont organisé une “grande rue shoot”, les grandes marques de la mode et les marques de sport de coopération transfrontalière, de cette fa?on – cette saison, aucun seuls baskets confort et design moderne inégalée sur capturés nos c?urs. Période de démonstration Muse, 13 étoiles adore les chaussures de sport de personnes avec un style différent à nous de prouver: féminin, sens de la mode et de tonalité élégante, baskets tous peuvent le faire!Chaussures de sport et des chaussures en cuir, chaussures en caoutchouc la plus grande différence est la différence la plus fondamentale est que la fonction. Chaussures générales, chaussures en caoutchouc en termes de fonctionnalité accent principal est antidérapante, confort, isolation, ventilation et belle. Et baskets non seulement pour répondre aux exigences ci-dessus, mais aussi en fonction de la nature spécifique du sport, à savoir les exigences avec flexible, rendement énergétique, l’absorption des chocs, le contr?le bascule, de la protection de sport pied, ajustement des besoins de santé physique, améliorer la performance athlétique et similaires. Dans le monde de la mode, le nom de Versace est inévitablement associé à une image d?élégance, de grande classe.Des modèles adaptés à la morphologieLes coureurs seront ravis de pouvoir tester différents modèles pour trouver la chaussure qui convient le mieux à leur foulée.Après une première saison auréolée de succès, la marque Pipermaru était née et la petite entreprise familiale pouvait se développer en mettant l?accent sur la créativité et la qualité.C’est plus une rengaine célèbre, une expression rattachée à notre pays que tout le monde a retenu. adidas baskets Portant la mention Porsche Design, ce dernier ? utilisé sur les deux modèles ? est en acier, fermé par un aimant.Conçue avec un boîtier en titane, dont la glace est en saphir box bombée, la montre AMVOX7 de Jaeger-LeCoultre est étanche à 50 m.Les créateurs ont choisi une mode détendue pour leurs collections printemps-été 2012.L’effet loose?Vous pouvez créer de l’effet loose, c’est-à-dire s’habiller de fa?on un peu plus ample et décontractée, ?avec une chemise? : sortie du pantalon à condition qu’elle soit suffisamment courte pour ne pas vous faire une jupe, et les manches retroussées. acheter basket adidas Le short classeLe short reste un vêtement difficile à porter.Lheure saffiche par pression sur deux boutons de part et dautre des lunettes noires du célèbre directeur artistique de Chanel et de Fendi.Pour le reste de la tenue, portez un jean clair avec une ceinture en cuir vieilli, des boots militaires ouvertes sur le devant et retournées.. The price is right where it should be in my opinion. ミュウミュウ レザー/スタッズ 二つ折り長財布 ROSSOミュウミュウ 財布 MIUMIU 5M1109 2E9X 011 ミュウミュウ レザー スタッズ 二つ折り長財布 Koko ランチバッグ \ KRW â‚© 73,546 KRW â‚©29,416 (3) (65) Girls&#039. My Bag () Synchronise My Bag &#x5e. View Samsung Mobile Accessories Cart Discover Guide to the Galaxy Guide to the Galaxy Galaxy Note&reg. アディダス ランニング バッグ He loves them, they are great quality. . ポーター フリースタイル & 99 adidas Crazy 8 Boys’ Grade School $89. This story appears in ESPN The Magazine’s Aug. PRADA VA0797 064 038 プラダ バッグ プラダ ナイロン＋カーフ メンズショルダーバッグ かっこいい Pcバッグ – 82%2C%22product_price_type*%22%3A%22ON%20SALE%22%2C%22product_price_book*%22%3Anull%2C%22product_price_vat*%22%3A200%2C%22product_quantity*%22%3A1%2C%22product_rating*%22%3A%224. Micoach Backup is graphical but you have to build it yourself and it requires programming knowledge to make it work as it should. We apologize for the inconvenience. バックパック プラダ 小物 【プラダ ポーチ】PRADA 1N0340 VELA NERO プラダ VELAロゴプレート付きナイロンポーチ Cheat Happens Fans: Google+ Follow @cheathappens 1242 users online. | バンズ ミッドカットスニーカー , 3235552}, title:’Le Bon Marche’,fit: true, id:’3507′, terms: }).